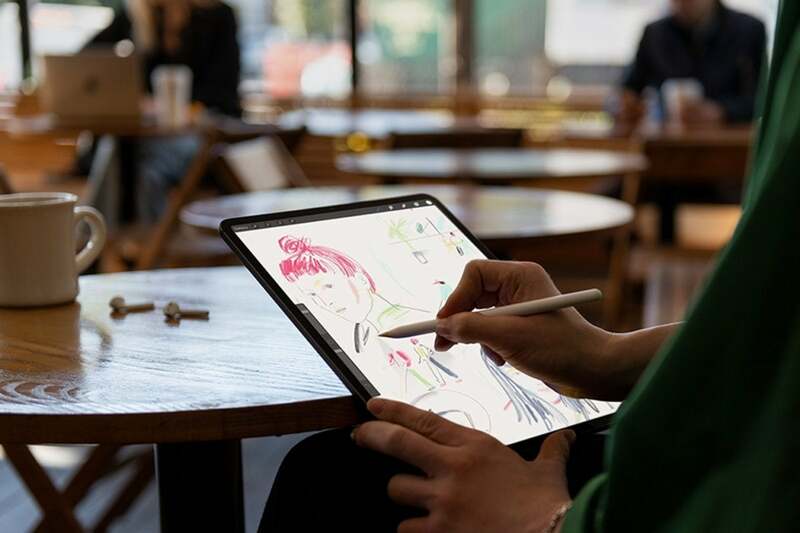 With its world-class design, rock-solid operating system and a deluge of apps, the Apple iPad Pro 2018 is the best tablet you can get. It’s the best iPad Pro since the last one with a faster processor than many notebook PCs. With its world-class design, rock-solid operating system and a deluge of apps, Apple’s pro tablet is the best tablet you can get. I’ve been using a new iPad Pro for about a week. I even published a few unboxing pictures. The entire process begins when you pull a single tab on the side of the box. If you then follow the flow Apple designed into the packaging, you’ll have the device right side up and in your hands in seconds. From opening the box to completing the set-up, the process is fast, though downloading all the apps and data you need takes additional time. Once in your hands, just tap the power button, and thanks to Apple’s Automatic Setup process, you don’t even need to enter your Wi-Fi password. Once you’re in, everything works. Your apps, documents, and all your iCloud data are right there, clearly visible on the iPad Pro’s Liquid Retina display. The colors look fantastic on there, too. The simplicity of setup is deeply thought through. You may then see a red tag on the Settings pane. Tap this, choose General>Software Update, and install the most recent software update. Apple releases regular software updates for its tablet, these boost security, fix software flaws, and introduce new features. iOS 12 now supports devices up to five years old. That means the iPad Pro you just took out of the box shouldn’t be defined solely by what it can do today, but all the other things it will be capable of tomorrow. Some might argue that tomorrow’s features may require hardware components that aren’t present in the device. Apple controls many of the key components used in these systems — the CPU, GPU, ISP, Neural Engine, and more. Apple’s internal development process may be secretive, but the work its various teams engage in is planned. That means it’s logical to think someone at Apple had a vision of what kind of processor the company wanted to build in 2018 when the company spent $278 million to purchase PA Semi. It’s also logical to think the components it has worked so hard to develop, miniaturize and deploy inside this year’s iPad Pro were also designed to support the company’s future plans. Since 2010, Apple has described the iPad as part of a future vision of computing in which most tasks are transacted on mobile devices, while a dwindling number of activities require more traditional computers. I won’t waste your time listing (or mine repeating) the tech specs of these new iPads. You can read them for yourself on Apple’s website. The 7nm A12X chip and all the other components in the iPad Pro mean the hardware has the capacity to support future incremental improvements as mobile devices replace an increasing number of formerly PC-only tasks. The thing is, while I know what I can and can’t do with the iPad Pro I’m using today, I’m unable to predict what else it will be able to do next year. All I do know is that third-party applications that don’t run on an iPad now will come to the platform, Apple will continue to refine the product’s multi-tasking features, and third-party online services (public, private and enterprise) will offer better iOS support as they are updated for a mobile age. Apple seems to be focused on iPad Pro as a creative machine. It pushes creative apps and took time to show how photography, video, and other tasks run so well on these systems. For example, I’m writing this review using an iPad Pro. It runs Word courtesy of Office 365, and I’ve been using both Apple’s new Folio keyboard and an old Apple wireless keyboard I have around to type. I still prefer a mechanical feeling keyboard, but I think that’s only because after writing for two decades I’ve become accustomed to it. Once you get used to using multitouch on the device, you’ll be smashing through the apps, getting work done and taking advantage of Split View, Slide Over, and all the other multi-tasking tools inside these things. The only slight frustration (still) being the inability to open two instances of the same app side by side – unless you are using Safari. Apple must surely be considering tabbed windows for apps as a workaround for this? You see, there are some compromises: Not everyone finds it easy to be productive with a mobile operating system, and some third-party apps still require a conventional computer. Another challenge is third-party enterprise software that doesn’t support iOS — I have problems working with content management systems, for example. The latter is hardly Apple’s fault — it represents the blinkered myopia of the last battalions of a declining Windows monoculture that made IT think they needed to support only one platform when creating enterprise apps. Hopefully, enterprises that buy into that kind of thinking will listen to organizations like IBM or SAP and begin to change their solutions to recognize the realities of our brave new multi-platform computing world. Another compromise: Apple has moved to USB-C with the new tablets. You can use this port to recharge your iPhone and get images off a camera, but you can’t hook the system up to external storage unless you happen to use Wi-Fi based storage that you access with an app. You can also mirror your iPad screen on an external display using USB-C, though you can’t run a separate app on the second screen, which I’d find much more useful. I think there are enough people engaged in productive work who want to us an iPad who will request both external storage and the capacity to use a connected monitor as a second screen in the full sense that Apple will listen to those needs. Or maybe someone will develop apps for those tasks. There’s no headphone port — though you’ll find the device’s internal speakers deliver plenty of volume and excellent sound separation, whether you’re playing Eric Satie, Flohio, Roky Erickson, or Childish Gambino. Finally, battery life. Apple promises 10 hours. I’m seeing much more than that, but I imagine you’d see lower performance if you were using demanding apps. What is it like using Face ID? Face ID is capable of identifying your face at a much wider set of viewing angles than before. The introduction of this feature meant Apple had to change some of the gestures used to control the iPad. It takes a little getting used too, but once you cross the line, the only slightly annoying thing is the need to raise the iPad slightly if you are using it flat and need to use Face ID. The other is the tendency to hold it on the side of the device when you do, which tends to block the camera. iPad Pro is full of magnets. Magnets hold the body together, drive those brilliant speakers and keep your Apple Pencil connected to your system when not in use. That Apple Pencil has some new talents, too: Principally it has a capacitive touch array, which lets you change tools with a double-tap. The thing about this is you can change what that double-tap achieves in Apple Pencil Settings. App developers can also create their own sets of tasks you can achieve inside their apps using the Pencil. I find this rather interesting, and I have a hunch we may find Apple Pencil emerging as the iPad equivalent of the Option/Control button on tasks, enabling more deeply contextualized tasks. It’s all about software. Apple’s iPad Pro is not a product that is solely defined by what it is capable of today. It is also designed as a platform that will support Apple’s software innovations for the next few years and (logically) also enable third-party developers to build increasingly complex solutions for these devices. Addictive software experiences are core to the company’s services strategy on which it is building its future business. So many iPad Pro reviews I’ve read seem to only half-understand this. They bemoan missing elements in the software, even while ignoring the key reality that these devices have all the horsepower Apple needs to support future software patches that should address those problems. They ignore (perhaps deliberately) that just as 2017’s iPhone 8 became an even better device with iOS 12, 2018’s iPad Pro will deliver new enhancements with iOS 14. This is not a product you purchase to replace in a year. It will actually get better with age as Apple improves the operating system that drives it. Is it a computer replacement? Of course not. We’ll always need a few trucks. But for tens of millions of computer users, iPad Pro is all the computer they need. And the number of tasks it can accomplish is growing — it will even run Photoshop next year. With prices starting at $749, it may seem expensive in comparison to cheaper tablets. But (as Steve Jobs said when comparing iPods to MP3 players), you’ll still be able to do more with your iPad Pro in two years’ time when those cheap tablets are in a landfill or sitting at the bottom of your old gadget box. That’s factored into the product price. I’m going to continue using my iPad Pro to get things done, and I’ll be sharing my advice on how to use an iPad Pro as a notebook replacement in my regular series of posts here. Bottom line? Apple’s new iPad Pro is the Aston Martin of tablets and defines the future shape of the industry. And everybody knows it. Please follow me on Twitter and join me in the AppleHolic’s bar & grill and Apple Discussions groups on MeWe. This story, "iPad Pro 2018: A review" was originally published by Computerworld.